As I reflect back on my experience with the Center for Nutrition Studies Plant-Based Nutrition Certificate, offered through eCornell, I realize what a profound impact the presenters’ words had on me; I especially appreciated the way Dr. Pamela Popper shed light on how industry, medicine, and the government prevent Americans from really becoming well, and how Dr. Caldwell Esselstyn discussed his vast clinical experience in both treating and reversing heart disease. The weight these two added to the Plant-Based Nutrition courses cannot be understated. 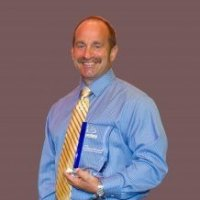 For the past 31 years, I have traveled the world teaching concepts for healthy living to individuals: strength training and sports conditioning program development, how to become a personal trainer, and, my favorite topic, nutrition. Throughout my journeys, I have noticed significant health improvements in individuals who cut meat and dairy out of their diets, myself included. The certificate courses reinforced my belief that eating a whole food, plant-based diet can increase one’s overall health, prevent disease, and even reverse many diseases. My passion, what drives me to read journals, current research, books, listen to other professionals in the field and continue my post doctorate work, is the end result. There is nothing more fulfilling than standing before an audience presenting the science I have learned as workable guidelines, translating the technical language into workable language that is easy to understand and incorporate into their lives, or witnessing the look in a conference delegate’s eyes as they grasp a thought and connect it to their own life. 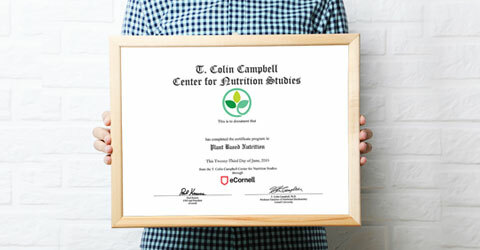 I am forever grateful to the T. Colin Campbell Center for Nutrition Studies for their courses in Plant-Based Nutrition, as they provided me with many tools and resources to continue with my mission to educate the public on the role of proper nutrition in maintaining long-term health. Taking these courses opened my eyes to the paradigm shift that is taking place in the medical world: diet and nutrition are being considered more than ever before as fundamental in the prevention and reversal of chronic illness.